Imagine if you will, enjoying an evening with friends outside. Now imagine it with the flickering flame of an open flame. Doesn’t the ambiance of the fire make the evening that much better under the starlit sky? At Hutcheson Horticultural Company we’ve seen an upward trend in Woodstock, Alpharetta, and Roswell stone fireplace installations. 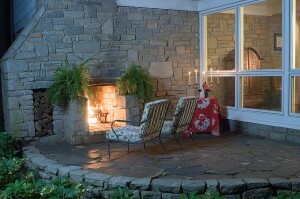 Our design team is able to expertly design a unique outdoor stone fireplace just for you. Whether you’ve found inspiration from the ideas on HGTV, or from eating at a local wood fired pizza restaurant, we want to help you create an inspiring design that will be a focal point of your outdoor living. Since the materials and designs vary from project to project, one installation is never the same as another. Hutcheson Horticultural Company not only offers extensive design services, but also custom installation services. Our install team will make sure that the quality and craftsmanship comes through with your custom work of art! Contact the design team at Hutcheson Horticultural Company to get going on creating an outdoor living space that you can enjoy all year long.